It is difficult describe objectively, in canoeing sport, the parameters that determine a high level of technical efficiency. After all, what really matters is that the boat goes as fast as possible and being able to maintain that speed as long as possible. Any competition distance. The technical condition is a quality that develops in long or very long periods. Until the paddler, once it has completed his motor development, doesn´t reach the proper strength level, it is difficult to achieve a high technical level. Meanwhile this moment comes, it is very important to develop, since the early years paddling, the various aspects of the athlete’s motricity, the coordinative capabilities. So, if we are able that the athlete, reached his physical maturity, brings together appropriate levels of strength and technique, he will also be able to improve more effectively advance of the kayak on each stroke. 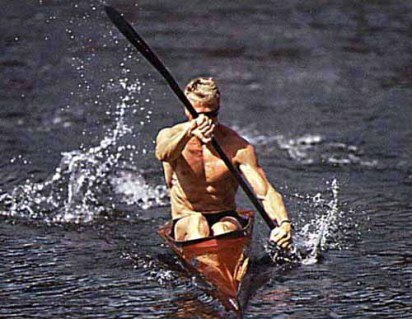 High levels of physical condition, in paddlers who have automatized complexes coordination levels of the kayak technique, allow the athlete to feel, in the “tuning” and during the competitions, that he´s in “the zone”. The paddler feels, in these phases, that any movement made for the different body segments during the stroke cycle, represents a positive impact on the boat advance. The paddler doesn´t perceive as “strange” elements, the footrest, the seat or the paddle shaft. It is not difficult in this situation of “fullness motricity” feel the boat gliding smooth, with no sudden movements, reducing a lot the frontal resistance of the water. The impulse generated in the muscles, flows through the circuits which form segments of the trunk, arms and legs, and it is transmitted efficiently to the boat. Without apparent effort, the sequence contraction-relaxation runs harmoniously, in the aquatic and aerial phases, stroke by stroke, enforcing a fundamental axiom of the kayak technique: the economic paddling. Spend the lowest possible energy with the maximum possible advance of the boat per stroke. Let´s go further: when the paddler is in “the zone”, he feels the boat and the paddle as parts of his body. The distal part of his arms are not the hands anymore, but the paddle blades. The hips and legs are fused with the kayak through the seat and footrest. When the paddler is in “the zone” leaves his human condition and metamorphoses into a hybrid, made with carbon and muscle tissue, able of paddling at optimum performance levels. Esta entrada fue publicada en "Mi Piragüismo" y etiquetada Canoe, Carlos-M. Prendes, Kayak technique. Guarda el enlace permanente.